For several decades qualitative research has been under-represented in criminological and criminal justice research. 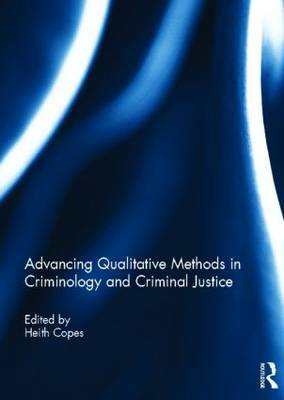 This book is designed to promote the understanding of qualitative research designs and to encourage their use among those seeking answers to questions about crime and justice. To this end a number of top qualitative scholars have been assembled to provide their insights on the topic. The chapters that appear delve into the state of qualitative methods in the discipline, the potential ethical and physical hazards of engaging in ethnographic research, how to make sense of and interpret participants' stories, innovative ways to collect data, the value of using mixed methods to understand crime and justice issues, effective strategies for teaching fieldwork, and the inherent rewards of a career spent speaking with others. This book will be an ideal introduction for students and scholars of Criminal Justice, Criminology, and Sociology, regardless of whether their primary methodology is qualitative or quantitative. This book was originally published as a special issue of the Journal of Criminal Justice Education.